I'm in the same boat, this has greatly impacted my use of this tool. When I search for a tag it should include both Personal and Business notes which have said tag associated with it. I lean on Evernote all day every day for both business and personal use. At the very least please provide a checkbox in options to revert this undesired change. Good grief, is there no way to move a note between Personal and Business notebooks anymore either? This last "improvement" completely broke our usage of what came to be a critical tool. It's currently unusable (extraordinarily cumbersome at best) for my team's day-to-day requirements. This "improvement" is absolutely shocking ! - If this feature is not restored then we will seriously need to find an alternative to Evernote. All 10 of our Business Account users are complaining and asking me for the fix ! Before I could search "all" or "current context" which could be a specific notebook or only documents with a specific tag, and searching for and adding tags to the context was easy and straight forward. I really don't like the change and like most people, I'm also starting to look at other application solutions. 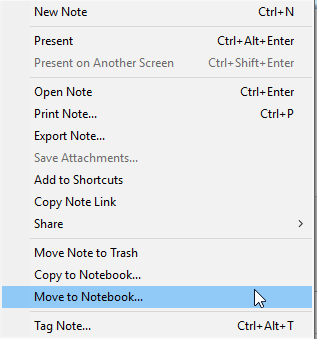 @mtomsovic You can still move a note between Personal and Business notebooks: right-click a note in the notes list and select Copy to Business... or Copy to Personal... and then once it's copied, delete it from its initial notebook (deleting is now called Move to Trash). Thanks Phils, I'm now aware of this. Unfortunately, this is a kludge and grossly inefficient to use with any level of regularity. Not everyone has a distinct wall between personal and business notes, there is a large amount of overlap with my usage and this "feature" completely killed usage for me. I've since reverted to the older version which works for now, at least until they fix their short-sighted change. It's worth mentioning that it's now easier in Evernote Windows to move a note than it was when I posted above. Now at the bottom of the Copy to Business... and Copy to Personal... dialog windows, there is a Delete original note checkbox option. So it no longer requires the extra step of deleting the note after you copy it. "It's worth mentioning that it's now easier in Evernote Windows to move a note than it was when I posted above. Now at the bottom of theCopy to Business... and Copy to Personal... dialog windows, there is a Delete original note checkbox option. So it no longer requires the extra step of deleting the note after you copy it." I'm confused though - the "Move to Notebook" option has been there for a long time. Why use Copy at all if the goal is to move the note? I just moved to Evernote business and am very disappointed to not have the option to search both personal and business notes in the same query. Will this be changed? It should be, like the others posting here, there could be no possible reason to not have it - especially since it's on the iOS app (again, for good reason!). Agreed - the inability to search both business and personal notebooks at the same time is frustrating. At least provide a toggle option. For what is that check box used? 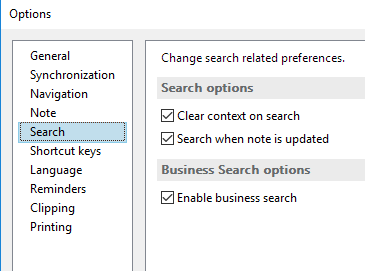 "Business search" is the banner at the bottom of a notes list when you do a search which says "Your company has 23 notes related to your search, and John Smith may know more." That checkbox turns that display on or off.